Oakwood University is a private university located in Huntsville, Alabama, United States. It is owned and operated by the Seventh-day Adventist Church established in 1896. It’s nickname is the Ambassadors and the University is a member of the United States Collegiate Athletic Association (USCAC). Their colors are Blue and gold and their motto is Education, Excellence, Eternity. 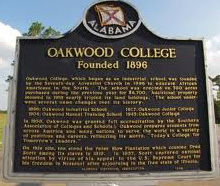 Oakwood University was founded in 1896 as Oakwood Industrial School. Legend has it that the school was named for a stand of oak trees found on the campus. 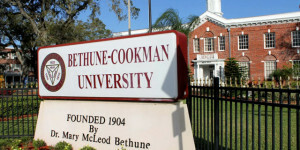 In 1904, the name was changed to Oakwood Manual Training School, and it was chartered to grant degrees in 1907. In 1917, the school offered its first instruction at the postsecondary level, and in that same year it changed its name to Oakwood Junior College. In 1943, Oakwood received its first accreditation as a junior college. Oakwood University owns 1,185 acres (5 km2) in Huntsville, Alabama. The main campus consists of 23 buildings spread across 105 acres (0.4 km2). Another 500 acres (2 km2) under cultivation. Building developments are continuing. The J. L. Moran Hall, completed in 1944 and named after the first black president of Oakwood, stands with more recently erected buildings such as the McKee Business & Technology Complex, completed in 2002. 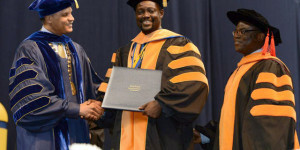 Biological Sciences, Business & Information Systems, Chemistry, Communication & Fine Arts, Education, English & Foreign Languages, Family & Consumer Science, Health & Physical Education, History & Political Science, Math & Computer Sciences, Music, Nursing, Psychology, Religion & Theology, Social Work. Center for Academic Success provides academic support services, including academic advising, tutoring, disabilities support services, and study skills courses. Library provides comprehensive resources and services in support of the research, teaching, and learning needs of the University community. Oakwood University provides financial counseling to students and oversees financial arrangements & financial aid. The Adventist Colleges Abroad (ACA) consortium External link provides opportunities to qualified undergraduate students for study in other countries, such as Argentina, Austria, France, Kenya, and Spain, while completing the requirements of their programs at their home colleges. Alumni Relations is here to keep you connected to the school you love and to the people you cherish.